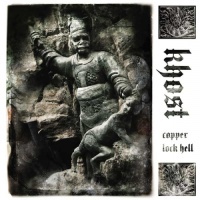 Copper Lock Hell is the debut CD from Khost, featuring the duo of Andy Swan (Iroha) and Damian Bennett (Carthage, Deathless). Between them they have been part of Final, jazz noiseniks 16-17 and Techno Animal and on Copper Lock Hell they continue to bring a distinct heaviness to their industrial doom sludge, with a varied cast of guest contributors including Tunnels of Āh, Eugene Robinson (Oxbow), Jo Quail (SonVer). It is a doom release but Copper Lock Hell throws up enough unexpected twists to push their sound into new areas. And that's before the Kevin Laska (Novatron, Transitional) remix which rounds off this phenomenal heavweight release. Copper Lock Hell is by no means a run of the mill doom release though. Sure some tracks, which initially appeared on Bandcamp, rely heavily on mammoth doom chords but Copper Lock Hell continually breaks new ground with the added dose of industrial electronics and incorporation of Japanese and Mid-eastern influences. The trinity of tracks beginning with '14 Daggers' are indicative of Khost's crawl paced doom sonics. From Jo Quail's brooding cello notes '14 Daggers' cuts abruptly to buzzing doom chords, treated Oriental chants, with scorched earth murmurings and lashings of heated percussive clatter. Here, like on much of Copper Lock Hell, Khost create an intensely layered doom industrial ambience. Both 'Hypocrisy Banality Possession' and 'Amoral Apathy Suppression' are strewn with ultra-heavy buzzing doom guitars, performed in ultra-slow fashion. The throat-shredding vocals of 'Hypocrisy Banality Possession' are framed by crashing industrial percussion, and woven by passages of eastern flutes, as lashings of buzz chord reverberate, often sounding out in a power noise shudder. 'Amoral Apathy Suppression' enters via backwards spinning tapes while Oriental pipes swirl around scorching vocal rasps and slow pummelling ritual beats. Layers of drone anchored around the sludgey monolithic guitar ensure another intense and inventive listen. It's clear Khost are onto something special with their earth shuddering doom ritual sonics. Tunnels of Āh, whose Lost Corridors album was a revelation of Gnostic electronics, augment a couple of tracks with their esoteric industrialism. From the uneasy churning electronics of the slight opener 'Copper Lock Hell' where a barrage of treated spoken voices based around the title to the slow, expansive piece of doom ambience that is 'In The Nest Of The Red Throat'. Here rises an ethereal voice whose delicate tones hover over textured guitar notes and gliding electronics and through passages of slow, grinding sheets of guitars which fizz and crackle throwing up obscured melodies. Even when they are joined by sinister mutterings and almost conventionally played drums the atmosphere remains pensive and captivating, resulting in a wonderful combination of experimental doom and subdued ambience, which provides unexpected lighter shading to the overriding pitch-black heaviness found elsewhere on Copper Lock Hell. Latter tracks pick up on the influence of guitar noise and extreme electronics. The pummelling bass distortion that underpins 'Drain' recalls the noise rock of Ice. That comparison isn't too wide of the mark, since Khost members have been part of the JK Broadrick projects Final, Atrocity Exhibition, 16-17 and Techno Animal. Yet for the most part 'Drain', which trails off with some spoken word from Eugene Robinson of Oxbow, flits between dense layers of shredded vocals and blistering guitar onslaught, with only the rhythm section and distorted bass separated from the obliterating wall of sound. 'Pacify' strays into experimental noise realms, its ultra-heaviness arising from textured noise ambience and crushing doom fashioned from experimental reverberations which for the most part dispense with the heaving monolithic chords. The closing Kevin Laska remix of '14 Daggers' which extends and reconfigures the original lacing it with considerably more ethereal and atmospheric elements to offset the scorching vocals. Set against a more rhythmic base giving greater prominence to Jo Quail's brooding cello movements it retains the hellish atmosphere of the original with a more measured moody ambience.